My lack of blog posts for the month of August has been due to the arduous task of packing and moving. But despite that, I still found time to make my first batch of cheese for this year. I’ve been looking forward to making cheese for a few months now, but it’s been an up-and-down year so far. 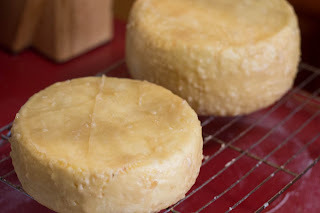 Coupled with my time constraints with moving duties, I kept this cheese recipe very simple. I warmed five gallons of raw milk to blood temperature, and then inoculated it with a basic starter, followed by rennet. Once the curd was set, I cut them into cubes, and drained off the excess whey. The curds were then stirred and cut to pea-sized cubes. I split the batch and made two wheels. One is a simple cheese, which I’m guessing will have a soft, springy texture similar to a havarti, with the grassy taste of the raw milk. The other is studded with candy cap mushrooms. I’m having a lot of fun cooking with these mushrooms and their odd, maple-and-curry flavor profile. I soaked dried candy caps in water for an hour, then briefly boiled them to kill any unwanted bacteria. I kept the soaking water, and used this to wash the curds of the larger wheel, as you would when making Gouda. Along with infusing the curds with the mushroom broth’s flavor, washing the curds also rinses lactose from the curds. 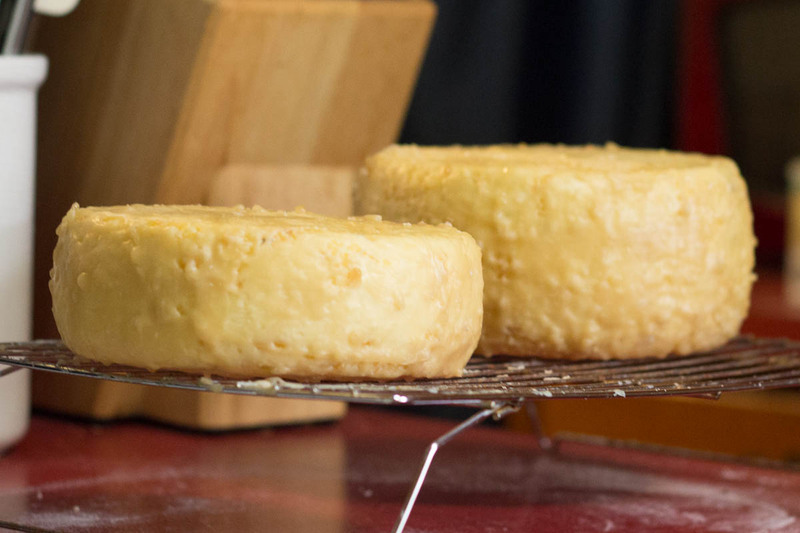 As the cheese ages, this lactose sugar would turn to lactic acid and make a sharper cheeses. Removing it from the equation will make a milder cheese and (I hope) help the candy cap flavor shine. After rinsing the curds, I chopped the mushrooms and mixed them with the curds before pressing them in their molds. Another issue with moving is that I haven’t set up a spot for aging cheese or meat yet. So I had to abandon my traditional bandage-wrapping of the wheels, and coated them in beeswax instead. This will keep the cheese from drying out­—something especially important since I don’t have a “cheese cave” set up to keep the humidity high. I don’t think I’ll age these cheeses very long, at least not the candy cap wheel. I think the cheese will benefit from eating while young and fresh, when the candy cap flavor is front and center, and not overshadowed by the stronger flavor of a mature cheese. Well, consider this my first step in getting truly settled in my new place!